Anthracnose disease was active as early as April 16 this year and has intensified in recent weeks on our low N fertilization plots. Active anthracnose disease on annual bluegrass (Poa annua) plots in North Brunswick NJ, 16 April 2013. One of our experiments has the objective of determining whether anthracnose can be managed with curative sprays if the turf is maintained under best management practices (BMPs). The disease management goal is to keep disease severity below 10%, a subtle level that does not impact visual quality or playability (ball roll). Our curative fungicide program included one spray just before the expected onset of disease followed by subsequent curative applications of fungicides. Curative sprays were applied once disease symptoms reach 5% with repeated applications occurring no sooner than 7-days and only if disease was active (severity increase). Our study focused on the practices of mowing height (0.090 vs. 0.125 inch) and N fertility (2.05 vs. 4.10 lbs. per 1,000 sq. ft.). 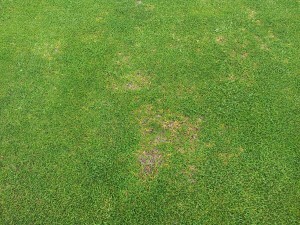 We were pleased to find that turf managed with BMPs required fewer fungicides but we were very surprised by how much. Annual bluegrass turf maintained under BMPs required 60-78% fewer fungicide sprays than turf maintained with one or two non-BMPs. In this year’s trial, we have already applied several fungicide applications this year on plots receiving the lower N fertility regime. You can see these plots for yourself at this year’s Rutgers Fine Turf Research Field Day at Hort Farm No. 2 in North Brunswick NJ on 30 July 2013. Click here to register. Hope to see you in July!